In order to better organize our ministries and provide leadership for the congregation it is necessary to keep certain pieces of information on all of our members. Most of it is pretty basic, like your contact information. Most people in the United States today communicate in multiple ways. We still make phone calls, but we also text, email, FaceTime, etc. For the congregation to communicate effectively we need a secure and easy way to store and share this information for each of the members. In your "My Profile" section you can enter your email, home phone, cell phone, address, etc. If you have recently filled out the Talent/Interest survey form then your information was updated automatically. As a member you have the ability to manage what information you want other members to see, specifically, you can choose to keep certain phone numbers, email addresses and physical addresses private. For instance, you may want to keep your work phone number and email on file with the church for emergency contact, but you don't want to share that information with the rest of the membership because you are not supposed to take personal calls on your work phone. To set a particular contact method as private, simply follow these steps. 1. Hover over the section heading, "Contact" and click on "click to edit this section." 2. 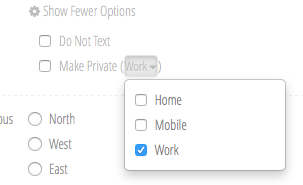 Now beneath each contact method you should see a link, "Show More Options." 3. After you click on "Show More Options," you can choose which phone number, email address or physical/snail-mail address you want to keep other members from seeing. Now no one but John and the system administrator will be able to see John Doe's work phone number. In today's world we have learned to value our privacy, and we've learned to guard our information because there are always people willing to take advantage of it. Before you go and set all of your contact information to "Private," consider, part of being in a congregation of the Lord's body is learning to be a family of believers, and learning how to be there for each other. If you mark all your information private, then no one will be able to contact you. If everyone did that, well, you can see how that wouldn't work real well. Remember, only other members can see this information, it's not available to the public, so you won't be put on any telemarketer list just because you included your information in the church's online directory.